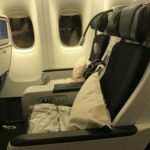 "the narrowest seat I have ever sat in"
11hr flight from Paris Orly to La Reunion. By far the narrowest seat I have ever sat in. I think it was even narrower than the seats on Ryanair which is a budget airline. Legs were pressed right into back of the seat in front and when they reclined it was game over. Never again. 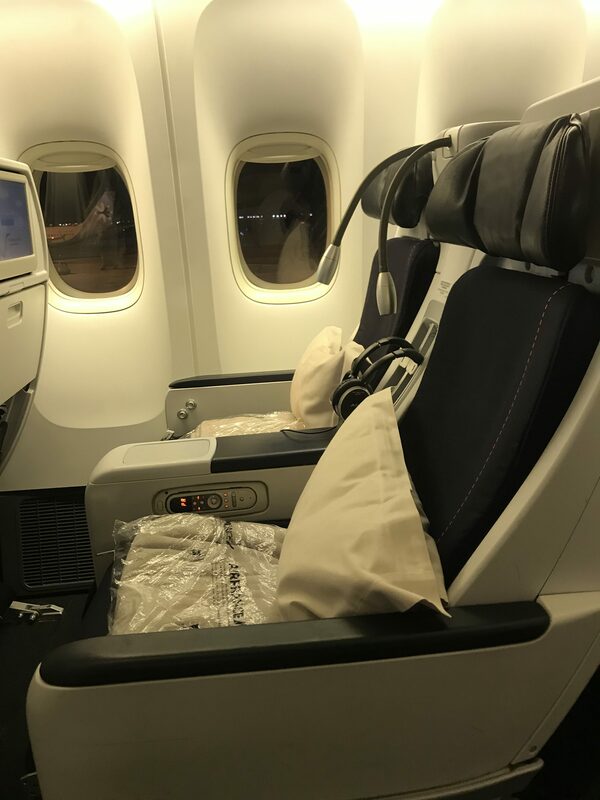 It is strange as I use Air France on European flights as well and the seats on the smaller aircraft are wider and with more legroom! I was seated 24K. 3 seats jammed in behind a row of 2 seats. 24J had minimum leg room and the large gentleman had to sit at an angle with legs in the aisle and third of his upper body in my area. Worst flight of my life. Very uncomfortable flight; I wouldn't travel on Air France again. With the seats in front inclined it was impossible to get out of the seats. All and all I wouldn't choose Air France again. I am a small person 5'3" and 110 pounds. For me my seat was the smallest airline seat I've ever seen. Eleven and a half hours of misery. Aisle seat at emergency exit so legroom not a problem. Seat is the narrowest I have ever sat on - perhaps it is slightly narrower than all the other economy seats to incorporate the tray table in the armrest? Also the hardest seat I ever experienced. How an airline can expect anyone to sit on this hard seat for twelve hours is beyond me. Given cramped seating and the harness of the seat I will never choose Air France for intercontinental travel again. CDG to HKG with B777-300 and HKG to CDG with B777-200. Economy class on the day to HKG from CDG was full. Very cramped cabin with 3x4x3 configuration. The seat on the aircraft was like wooden bench. I felt that the seat on B777-200 on the way back to CDG was a bit better. Has AF improved the seat? Either way their economy seat is far from satisfactory. Also on the way back to CDG they ran out of food available between first and second meal. If you take a long haul flight with AF make sure that you take some food with you just like the time you take a budget airline. "one of the worst experiences"
CDG-LIS on A320. Very little legroom for a 6.2 ft. tall. One of the worst experiences compared to most European airlines. I was stunned to find the seats so miserably uncomfortable for an intercontinental flight. The seats were extremely narrow short and very hard with very little leg room. 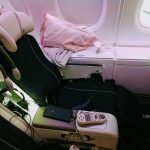 It became impossible for me to get comfortable in any way to be able to relieve pressure on my legs or sleep on my flight. There was absolutely zero room for anyone to get out of his/her seat to go to the restroom without having the entire row get up as well to let them out. I will never fly with Air France again because of this level of discomfort. 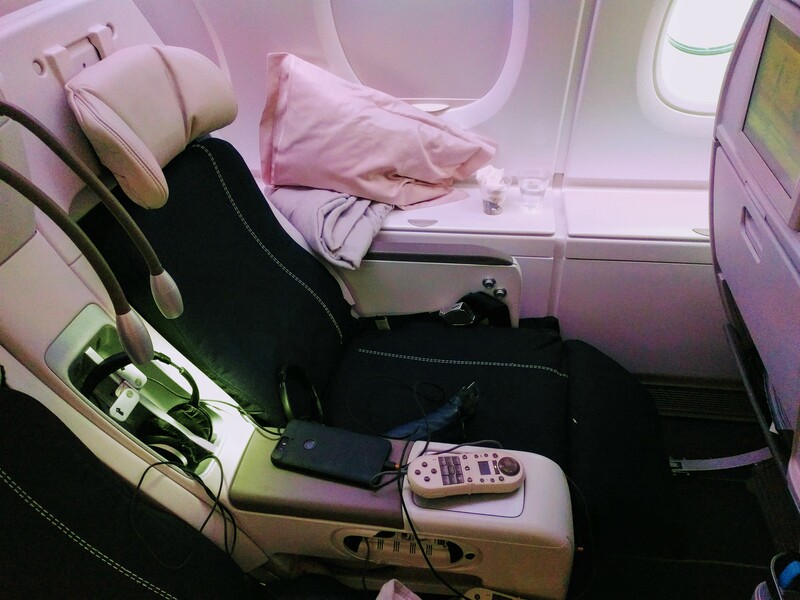 "plenty of room good comfort"
Premium economy Paris-Osaka for 11 hours. I sat at the front of the premium economy cabin. Pros- more legroom than the standard premium economy seats. Cons the tray tables are in the arms and not as large as the normal seats which makes working on a laptop a little less convenient. Overall I would certainly choose this seat again. I had a day flight both ways so did not try to sleep. Seat was comfortable for the duration and I did not find it too hard. As I was working most of the flight I didn't use the recline much but it seemed OK. The laptop power is standard 240V and either a standard French type or US plug will fit. It is limited in power and my laptop which is fairly low power would only work if the battery was taken out. That said the supply never faltered. Video was good with a reasonable large screen (although nobody could describe it as pin sharp) and a good choice of current films and TV shows. The earphones are OK but I used my own which plugged into a single 3.5mm socket so there was no need for an adapter. Service was OK not bad but not exceptional and the food was standard economy fare OK but nothing to get excited about. Overall a very pleasant flight and I don't think that I would have had much of a better flight in business class (but I wasn't trying to sleep). 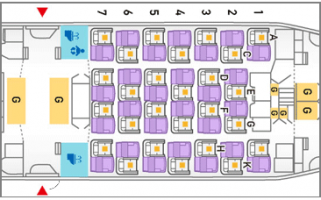 Overall plenty of room good comfort and easy boarding disembarking. Highly recommended. "hard shell seat gives feeling of extra space"
Flew the new AF Premium economy product. Pros: hard shell seat gives feeling of extra space and good AV (with noise reducing headphones and slot for own 'phones). Socket for laptop also handy tho' not used by me. Seat reclines (actually it "declines" in its shell) enough to aid sleep. Ticket class enables you to access AF lounge at CDG for a fee. The seat is very thin and very uncomfortable over a long flight. I bought a cushion in SCL for the return route but still had "numb bum". This detracts heavily from an otherwise good product. Please AF put some more padding in the seat cushion!